Cee’s Oddball Photo Challenge again . 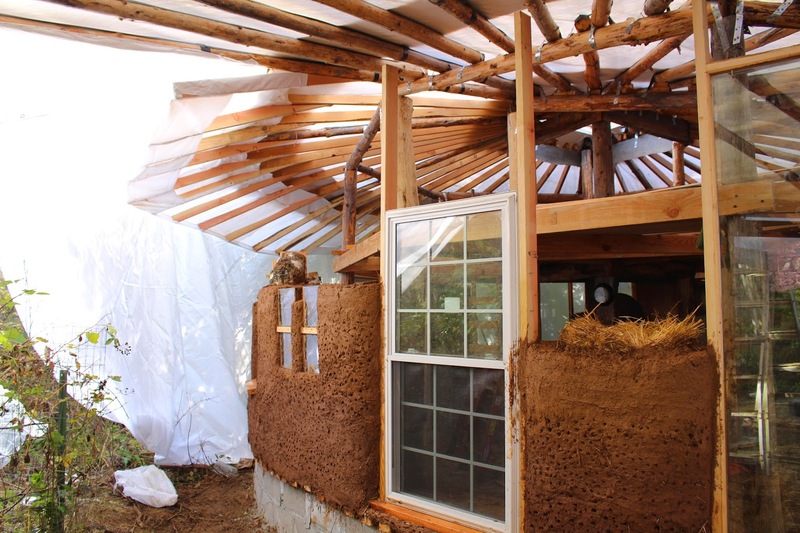 . .
Cob and Straw-Bale Cottage in Oregon. So much time has passed since my last blog! I have not been teaching workshops for the past two years because I needed to focus on my own healing and growth. 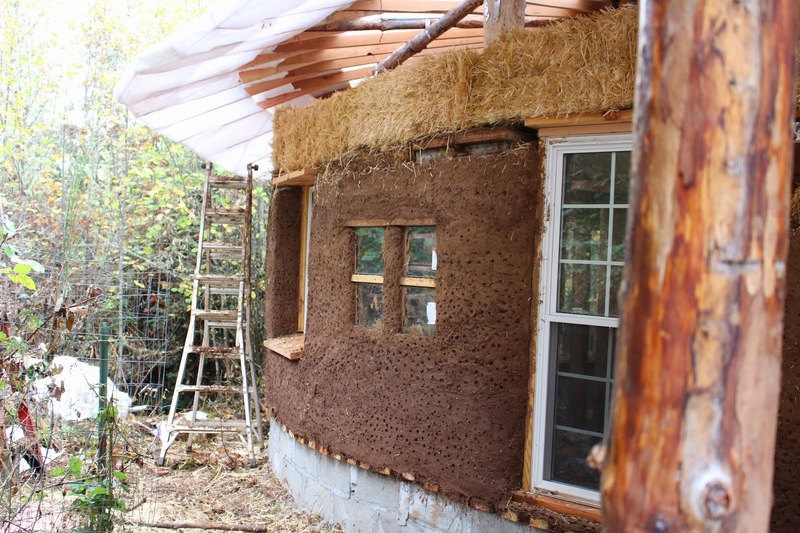 Projects in Oregon, such as this straw bale house, and Florida, such as my art shed building, and travel back and forth between my two homes, and Trackerschool (see trackershool.com) classes have been a large part of how I have spent my time. 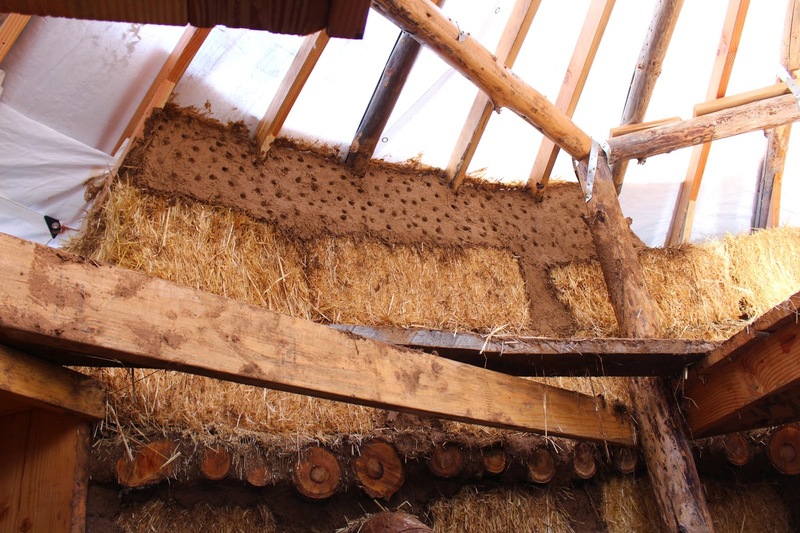 Pictured here is the little straw bale cottage we are building in Oregon, which needs more work this summer. 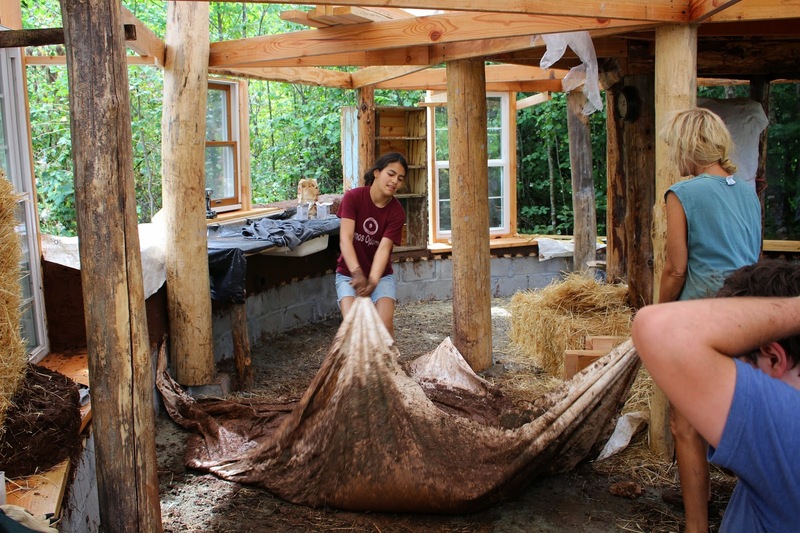 I decided to use the larger snail shell house we built earlier for more public gatherings of family, and for classes, so we are in the process of creating this smaller, cozier, straw bale and cob structure. I have to admit, I had my crew mix too much sand in the cob and the surface of the walls is crumbling, so when we get there this summer to work on it, we will be doing major resurfacing of the walls. The little finger holes you see on the surface here are created to give a final plaster surface a grip. Here, Cheryl, who taught me about cob after taking a class at the Cob Cottage Company, is teaching Rachel and Enrique how to mix cob. Cheryl’s mix was right, but I thought I could put more sand in it. Now I’m going to have to fix my mistake. They are stepping on the tarp folded over the cob. 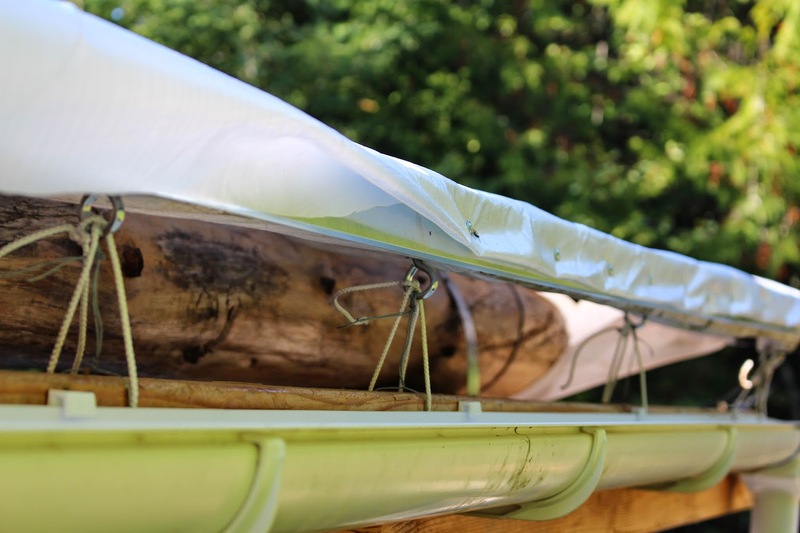 We found it a much cleaner and easier way to work, although it probably wears out the mixing tarps faster. I uncovered one of the cob surfaces and a little friend catapulted onto my face! 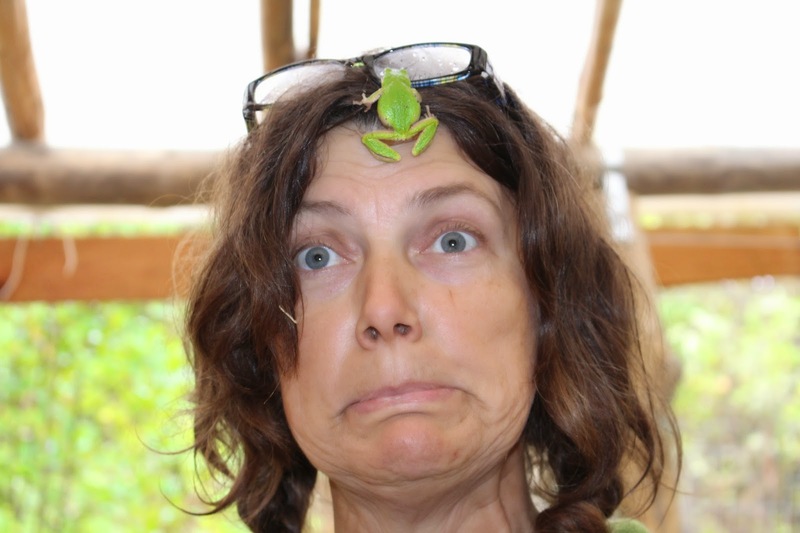 First the little frog hit my mouth and by the time we got the camera going it had crawled up a bit higher! 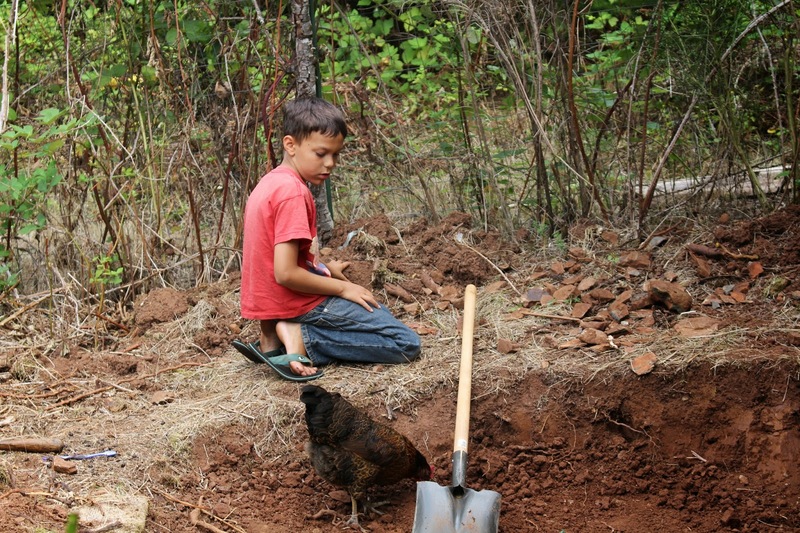 Ryan digs in the clay pit for worms for his favorite chicken! 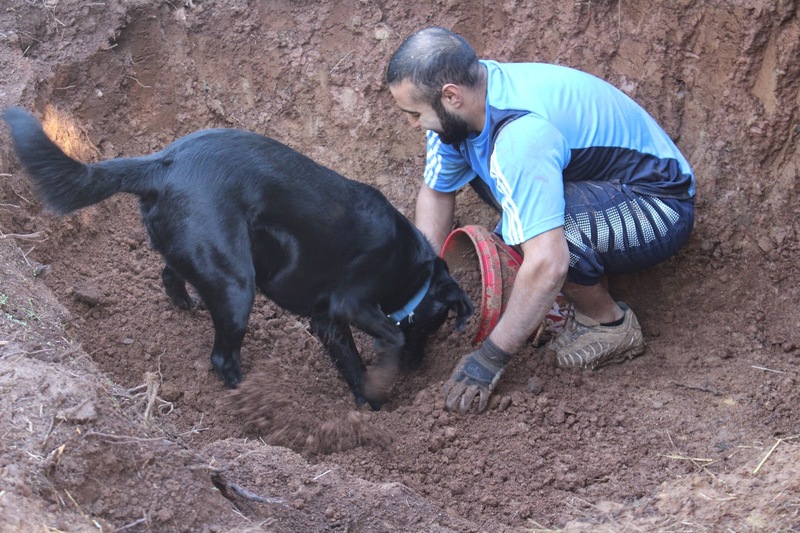 Enrique gets some help digging from Gypsy. We put the clay into large buckets and fill with water to let it soak. By the time we get through the 12 buckets to the most freshly dug clay, it is soft. 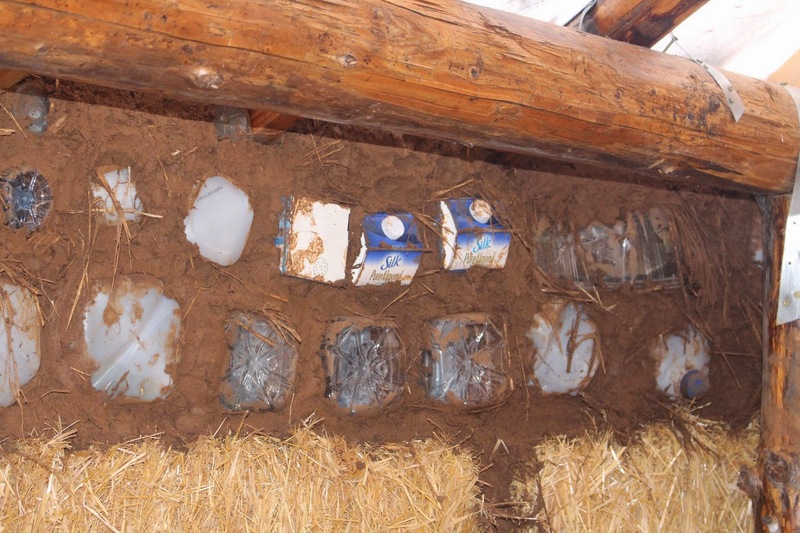 We pour out the water into a new clay bucket, and the soaked clay is ready for mixing with sand and straw. 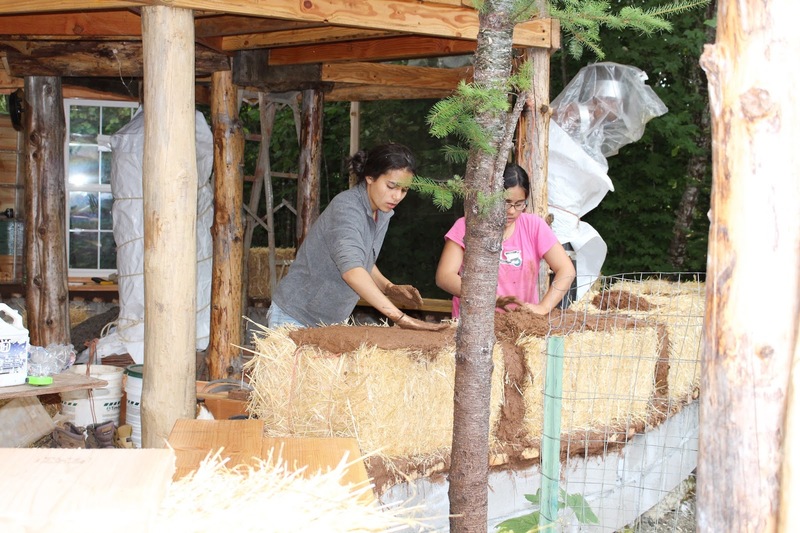 Cheryl and Juliana mix the clay and sand before squishing and adding straw. 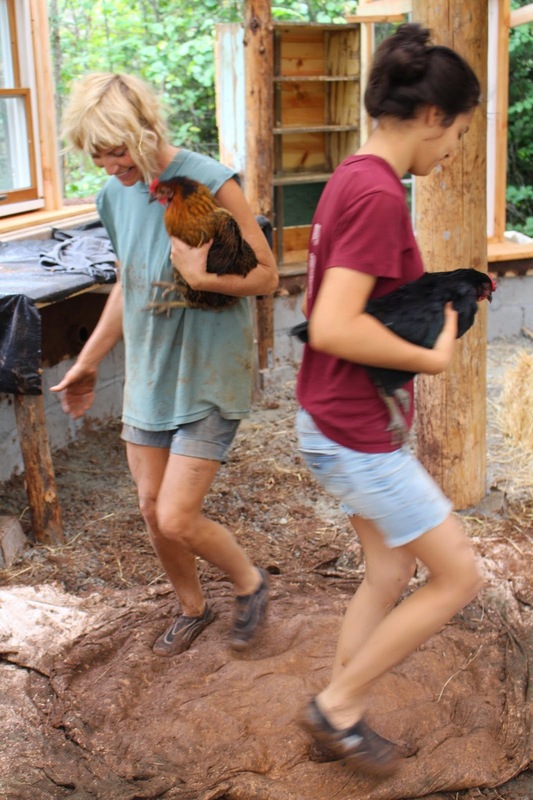 The chickens can’t resist getting underfoot so Cheryl and Juliana hold them as they dance the mud into cob. 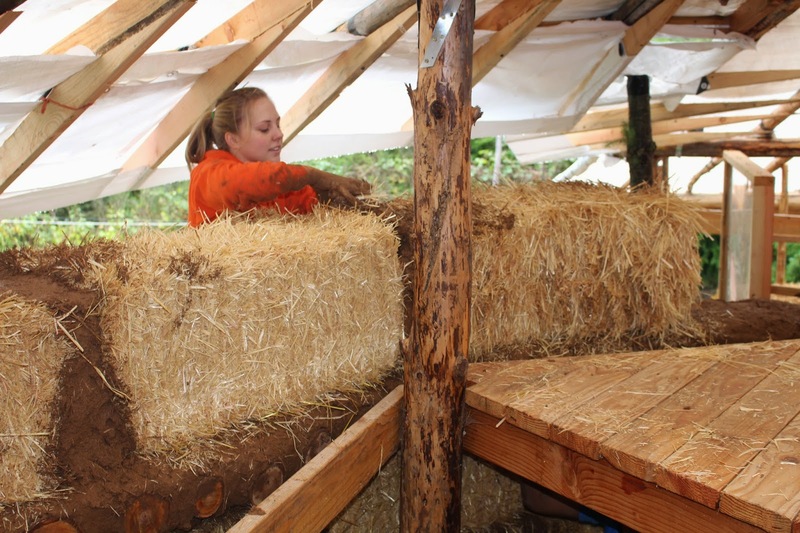 Juliana and Kin pack the gaps and fill in all around the straw bales with the cob mixture. 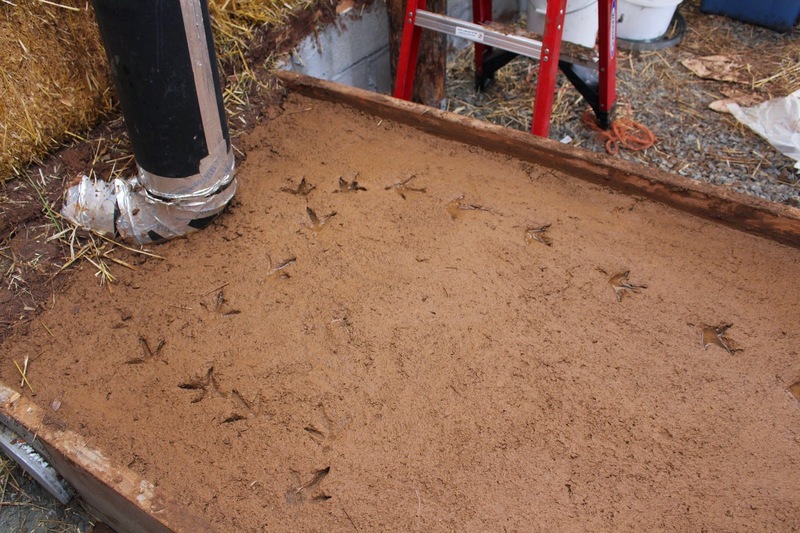 One morning we found mysterious tracks in the wet cob “heat battery” bed we made. 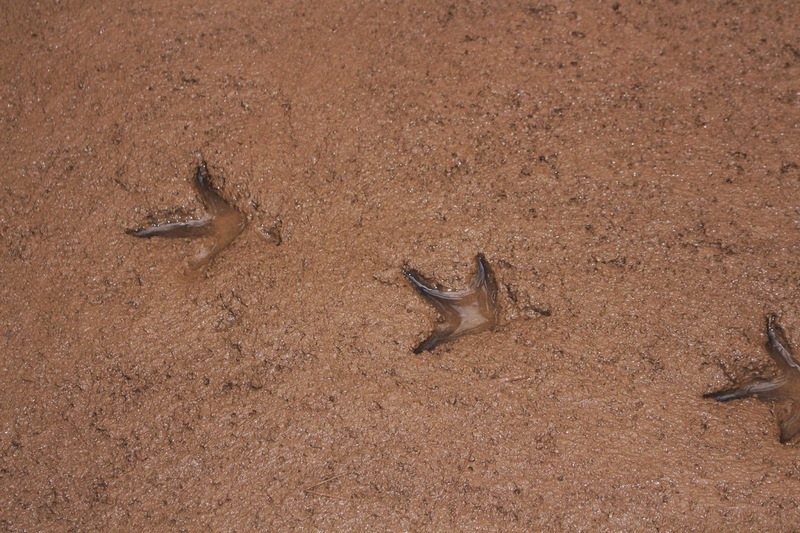 Can you guess what made these tracks? See the bottom of this blog post for the answer! We built some lofts for sleeping and storage. We put rails around them so kids won’t roll off in their sleep. 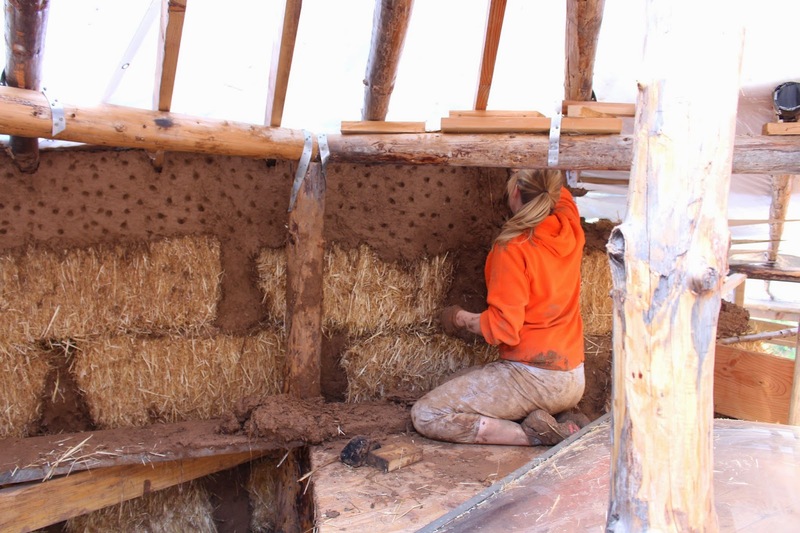 Rachel packs cob between bales near the ceiling. I’m sitting on the spiral “catwalk” we secured on top of the original white tarp roof before we re-covered the roof with more white tarp. It only lasts a few years but I love how much light comes into the cottage without having to have electric lights. 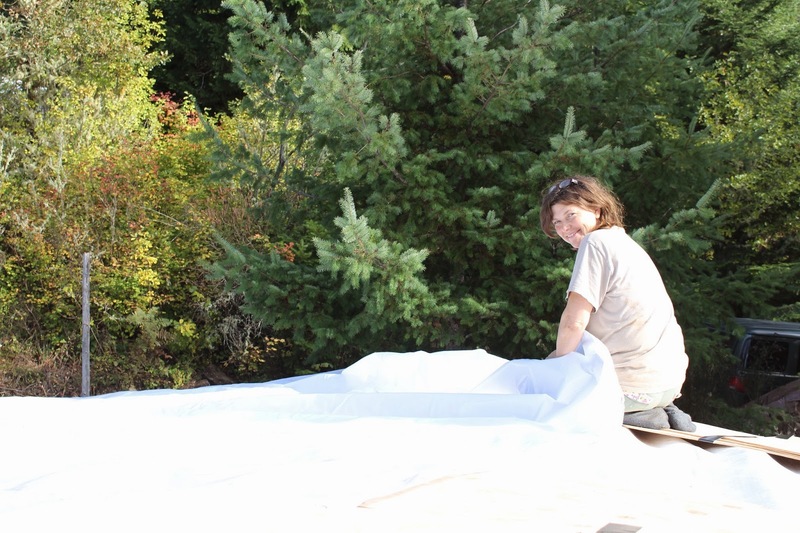 I’m pulling the new tarp over the whole roof. It’s careful and physically demanding work for a grandma like me because there is only the catwalk to step upon, so I do most of my moving around by scooting. 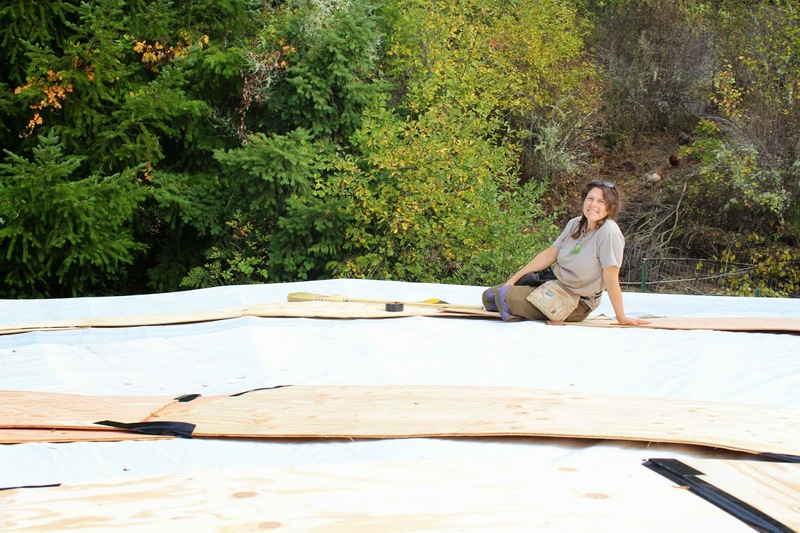 Here you can see the giant tarp hanging over the sides ready to be trimmed and secured under the eaves with a staple gun or screws. The sky light has been left open and is ready for the acrylic bubble dome I brought at a second hand building outlet store. Jonah wants to climb up into the loft. You can see the shadow of the catwalk over the cob walls so the cob could be packed up against the plywood catwalk and not simply against a moving poly tarp. 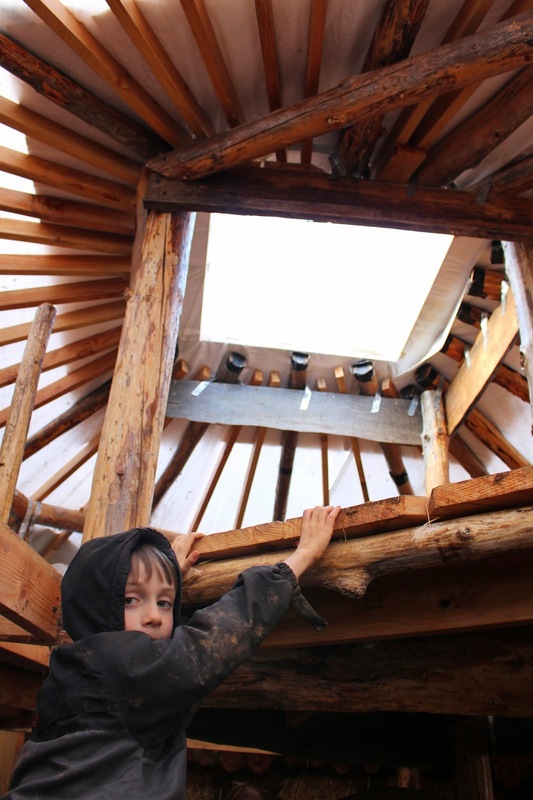 We used 1/4 inch thick plywood so it could flex to the shape of the conical roof, and doubled it so it would be strong enough to hold our weight and resist the pressure as we packed cob up against it. As the cob dried it shrunk a bit so this coming summer we will have to fill in the gap left at the top. 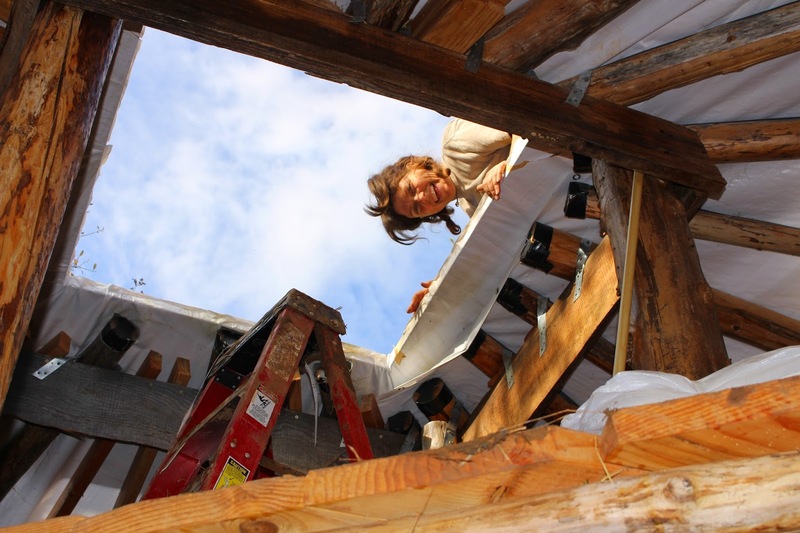 Rachel is working on the top of the wall while sitting on the loft. We made the mistake of having Enrique working on the outside of the wall on a ladder, which was leaning against the wall. Bad idea. His weight on the ladder gradually caused the wall to lean inward. It was not good and started collapsing onto the loft area with Rachel yelling for help to hold it up! We screwed the folded edge of the white tarp to the metal flashing over the rain gutter. 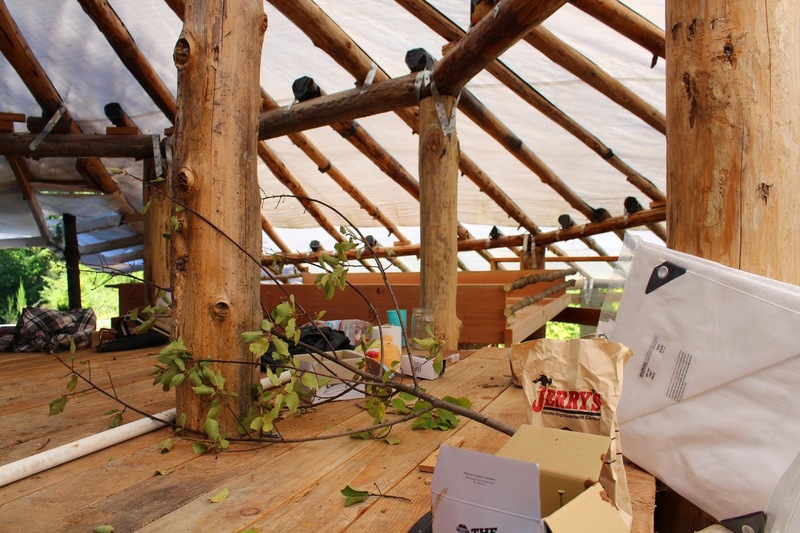 We set up a system to catch the rain water off this roof for use in the garden, washing, and hopefully filter it for drinking water. I learned a valuable lesson about listening to my body with this . . . I overworked my right arm as I continued to hold up the power drill and setting these screws. By the end of the day and a half it took to finish the roof edge, I could’t raise my right arm to work. I rested for a couple weeks as I was at a couple Trackerschool summer classes, and when I got back it was not much better, so I dragged my arm around with the power drill screwing boards to the loft areas. When we were finished for the summer, a few days later, I had damaged the nerves in my arm so badly (can you say carpal tunnel syndrome? Can you say tennis elbow?) that I have not been able to do any heavy work or exercise since. They are only now finally feeling pain free when I exercise a little bit, 14 months later! Lesson learned . . . listen to the body when it’s trying to tell you something! Inside view of kitchen area. 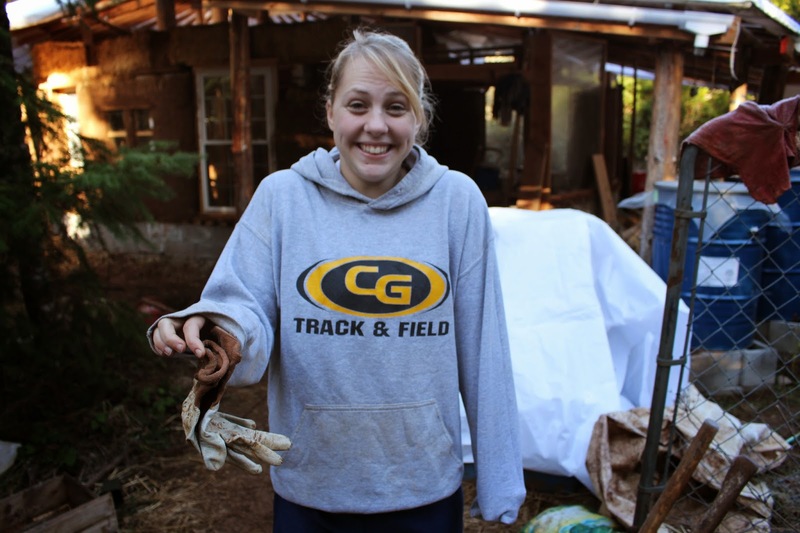 Rachel in the morning ready to work holding a frozen glove! It was getting late in the year and we were having freezing nights. We had to break the ice in the buckets to make cob. We were almost finished for the year, having finished the re-roofing. The rest of the walls would have to wait for the next summer. We began filling in with empty water and milk cartons to make the top of the wall work go faster. 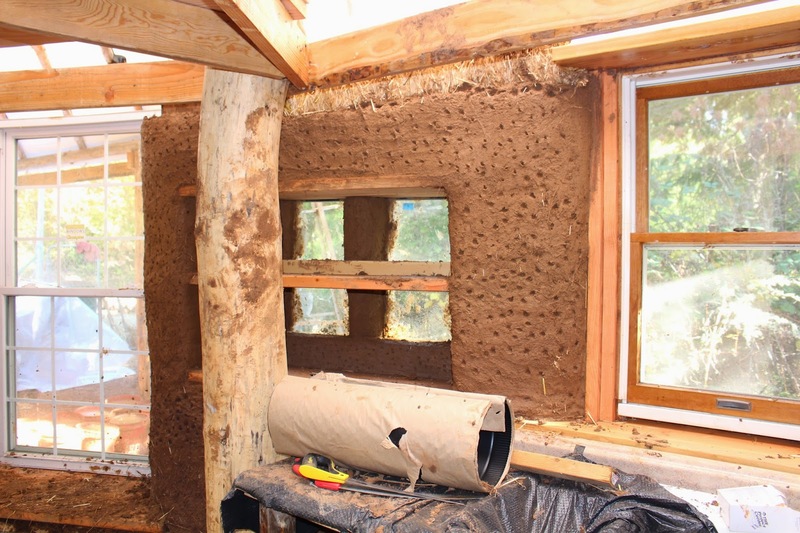 This also provides excellent air space for insulation. I have many things I have been holding in my heart, contemplating, exploring, enjoying, that I want to start sharing on this blog. Things I have learned through meditation and experience that have changed my life, my perspective, and how I approach the world. Look for future blogs about these discoveries as I find time to share them, and my ongoing projects and future classes. May you be well, be happy, and feel the joy and thrill of life in everything you experience.